The on line edition of the Romanian journal Anthropological Researches and Studies (formerly named Studii si Cercetari de Antropologie), continues a half a century old tradition of anthropological publishing under the aegis of The Francisc Rainer Institute of Anthropology (former denomination was The Anthropological Research Centre) in the Romanian Academy. The Institute’s first anthropological journal, Probleme de Antropologie (Anthropological Issues - AI), dates back to 1954. It covered three sections: „General Anthropology”, „Paleoanthropology” and „Physical Anthropology”. Seven volumes of AI were issued up to 1963. Starting 1964, AI gave way to two distinct journals : Studii şi cercetări de antropologie and Annuaire roumain d’anthropologie, the latter open to contributions written in either French or English. 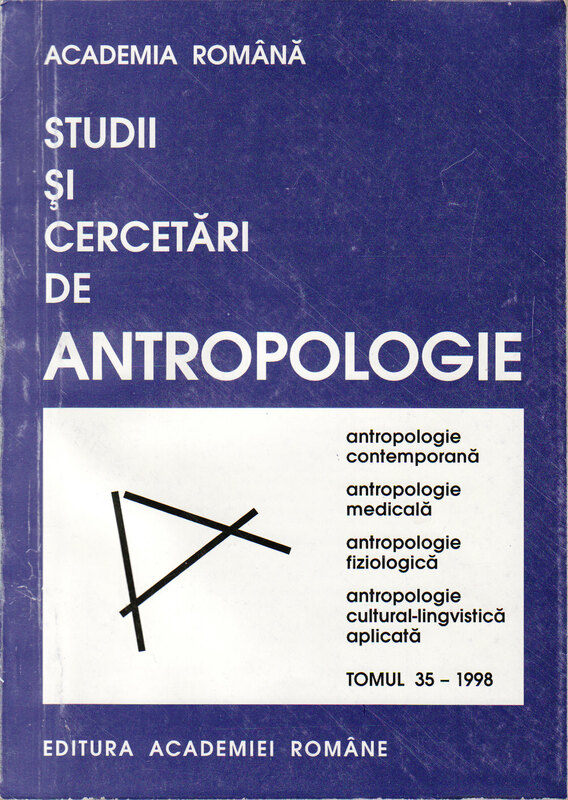 Studii şi cercetări de antropologie asserted itself as the main anthropological periodical in Romanian language. It covered contributions in paleo-anthropology, contemporary anthropology, and socio-demographical anthropology duly accompanied by abstracts in English of French. With current IT&C facilities, a welcomed opportunity arises to resume publication of Studii si Cercetari de Antropologie under the name of Anthropological Researches and Studies (ARS). The ARS Editorial Board is committed to support development of anthropological research in Romania while taking full advantage of the country’s admission into the European Union. The new edition of Anthropological Researches and Studies is designed as an international Journal of current anthropology bringing together contributions written in either Romanian or English or French, from either Romanian or European scholars – with no intended limits to contributors from other areas of the world. Starting with 2016, ARS has begun to publish only articles written in English or French, preceded by an abstract written in English. Milcu St., H. Dumitrescu, Atlasul Antropologic al Olteniei, Ed. RSR, Bucuresti, 1968, 274 p.
Milcu St., C. S. Nicolaescu-Plopsor, Romulus Vulcanescu, Atlasul Complex Portile de Fier, Ed. RSR, Bucuresti, 1972, 260 p.
Vladescu Maria, Corneliu Vulpe, Atlasul Antropologic al Munteniei, Ed. Academiei Române, Bucuresti, 1999, 182 p.
Radu Elena, Horst Schmidt, Cristiana Glavce, Atlasul Antropologic al Banatului de Sud-Est, Ed. Academiei Române, Bucuresti, 2004, 315 p.
Stirbu Maria, Georgeta Miu, Ana Tarca, Maria Istrate, Atlasul Antropologic al Maramuresului, Ed. Academiei Române, Bucuresti, 2004, 156 p.
Vladescu Maria, Corneliu Vulpe, Atlasul Antropologic al Transilvaniei, Ed. Academiei Române, Bucuresti, 2005, 294 p.
Elena Radu, Maria Bulai-Stirbu, Cristiana Glavce, Ana Tarca, Luminita Oana Ciotaru: Atlasul antropologic al Moldovei, Editura Academiei Române, Bucuresti, 2009.